WASHINGTON – While some changes have been proposed, more must be made to address a teacher shortage that is affecting K-12 education across the nation, particularly for low-income and Black students. 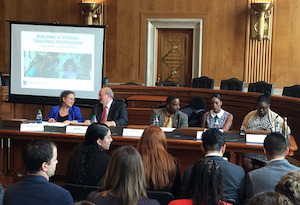 Strategies to address increasing the ranks of teachers in higher education and other pipeline problems were discussed Tuesday by panelists at a briefing organized by the Learning Policy Institute (LPI) at the Senate Dirksen Office Building. And amid the browning of America and its public schools, teachers of color are underrepresented as only about 20 percent of the workforce, with the percentage of Black teachers declining to just 6.7 percent in 2013, Kaine said. Such critical issues, he added, must be addressed when the Higher Education Act (HEA) of 1965 is again reviewed for reauthorization. The Preparing and Training Education Professional (PREP) Act proposes to make changes to HEA to improve the effectiveness of grant programs by building teacher and leader capacity to create student-centered, inclusive and supportive learning environments at the elementary and secondary levels. The legislation aims to enhance cultivation of a diverse and highly prepared educator workforce that recruits, equips and supports teachers in high-need fields at high-need locations. · Broaden the definition of a high-need school district to include those with teacher shortages and with a majority of schools identified for additional support and improvement by the Every Student Succeeds Act (ESSA). · Expand the mission of Teacher Quality Partnership (TQP) grants to include the recruitment of well-prepared teachers from underrepresented populations, emphasizing areas experiencing teacher shortages. · Require grant applicants to address a number of additional pipeline-enhancing criteria, such as including strategies for closing achievement gaps and preparing teachers to support the non-academic needs of students. · Create a set-aside to support states in their work to increase teacher and school leader diversity, improvement teacher-prep programs and address state educator shortages. · Support minority serving institutions (MSIs) by authorizing Title II grant programs of at least $500,000 to recruit and train teachers to implement evidence-based reforms that prepare educators to serve in low-performing schools, close achievement gaps and promote effective teaching and administrative skills through residency programs, mentorship and service scholarships. · Align evidence-based practices required under Title II with teacher-prep program activities at predominantly Black institutions (PBIs) and Native American Serving nontribal institutions. 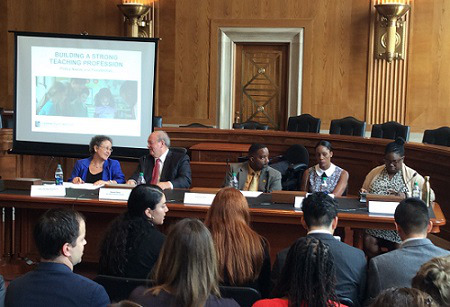 · Increase authorization levels of institutional aid to support efforts to prepare a diverse educator workforce. Some of the main reasons for teacher shortages relate to compensation, working conditions and entry pathways, noted Dr. Linda Darling-Hammond, LPI president and CEO. Black college graduates tend to have significantly higher student loan debt than White students, which motivate them to seek jobs that pay more than beginning teachers, she said. Without adequate training, mentoring and support in the classroom, she added, turnover is higher. More attention needs to be paid to tweaking the current system and diversifying paths to enter teaching, especially for teachers of color, 25 percent of whom enter the field via an alternative certification pathway, she said. The staffing shortage and other issues are played out regularly across the nation, with anger within the profession symbolized in the recent teacher strike in West Virginia. Teachers there were sick of meager salaries, punitive legislation and a general “devaluation of the teaching profession,” said panelist Dr. Steven Paine, the state’s superintendent of schools. One of the approaches the state is exploring is providing scholarships to attract students to the state’s colleges and universities to study and teach math after college, he said. Panelists emphasized the importance of rigorous teacher residency programs that immerse beginning teachers in the field and help them be successful early on with ongoing support. Such a program has been successful at Virginia Commonwealth University (VCU), said Dr. Andrew Daire, dean of the university’s school of education. Brittany Jones, a panelist who graduated VCU and teaches at a high school in Richmond, Va., said her residency helped her create rapport with students – an essential ingredient to engage them in the educational process and helping them have the confidence that they can go to college and succeed there.